This is a miniature urn and is intended to hold only a small portion of cremains. Its maximum volume is 3 cubic inches. 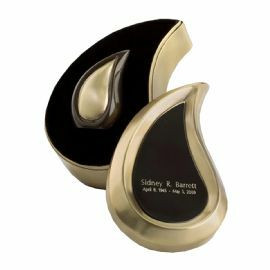 The Bronze-Tone Teardrop Ultra Keepsake brass token cremation urn set includes a Teardrop Token urn and a matching outer case that has an engravable top plate. The Teardrop token urn has a bottom-opening plate.